HomeConsigliHow Active is Buffett’s Portfolio? How Active is Buffett’s Portfolio? With a $500 billion market capitalization, Berkshire Hathaway is the fifth largest company by market cap in the U.S. stock market and the majority of the company’s value comes from three sources. The first is the 60 or so operating companies Berkshire owns and the future earnings power of those companies. The second is the cash on the balance sheet and the optionality to invest that in in the productive assets today and in the future. And the third is the value of the stocks Berkshire owns. Each will play an important role in the company’s long-term performance, but the stocks Berkshire buys and sells is what gets most of the attention each and every quarter. With that in mind, I thought it would be interesting to look at these stocks on Berkshire’s portfolio, like an investor would a standalone fund, assessing how Berkshire is positioned, how different the portfolio looks compared to the market and a few other factors that may shed some light on performance of Berkshire and what investors can learn. One standout feature of Buffett’s stock portfolio is how concentrated it is. In the table below, you will see that as of the latest 13F filing for Berkshire, Apple makes up 22% of Berkshire’s public equity exposure, while the top five positions make up 62%. The top 10 names make up a whopping 80%. To contrast this, consider the S&P 500, a broad index of large cap stocks. In the S&P, the top weighted stock carries a 3.7% weighting, while the top 5 make up 13.5% and the top 10 names come in around 21%. The high level of concentration is also true from a sector perspective, with financials leading the way. Berkshire holds about $60 billion worth of banks, both money center and regional banks. This equates to about 31% of Berkshire’s public stock exposure. The table below shows the bank positions and the total returns on each stock for the five year period ending November 30th, 2018. This table excludes positions in credit card companies Mastercard and Visa. Financial stocks have struggled recently, but as the five year performance shows, Financials, as represented by the Financial Select Sector SPDR ETF (XLF), have kept pace with the overall market. Berkshire’s five year total return is at the bottom as well for tracking purposes. To have the potential to beat the market over time, you have to look different than the market. A portfolio can look different from the market, or an index, in a few ways. First, you may hold a stock not in the index. Second, and more common in Berkshire’s case, a stock in the portfolio may carry a different weight in than it carries in the index. A measure called “active share” is a statistic that shows how different a portfolio is versus a comparable benchmark. Generally speaking, large cap portfolio managers with active share of above 80% are said to have “high” active share. Active share in and of itself isn’t a panacea for outperformance, but rather a characteristic of those who have the ability to generate alpha over time. Take Apple for example. As of the writing of this article the tech giant makes up 22% of Berkshire’s public portfolio but only about 3.7% of the S&P 500 index. That degree of difference contributes to an increase in active share in Berkshire’s equity portfolio when compared to the S&P 500 index. The larger a firm gets in terms of assets under management, the more difficult it may be to achieve high active share because of limitations in the stocks that can be bought. If you were to carve out Berkshire’s $200 billion in public equities as a standalone fund, it would be the third largest mutual fund based on assets under management using this list and only trails SPY in the ETF space. We’ve calculated Berkshire’s public equity active share, and based on our calculations, the portfolio shows an active share of 86%, so the holdings look very different than the market. 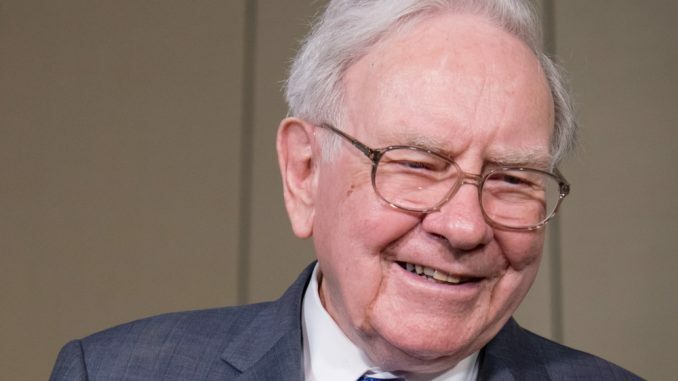 Buffett himself has said that future returns in Berkshire won’t come close to the past returns, but when viewing the portfolio through the lens of active share we can see the holdings and portfolio composition are quite different from the overall market. For most investors, emulating Buffett’s approach to building a stock portfolio — i.e. making concentrated bets that are sometimes contrarian and looking very different from the market — is not realistic, but it can be fun and interesting exercise to think about what it may take in order to construct a market beating stock portfolio. Still, I believe investors can learn a tremendous amount by looking at his holdings and thinking about Buffett’s investing process, discipline, long term investing approach and paying attention to the value you pay for a stock. If you can get those things right, you give yourself a good chance to generate satisfactory returns over time.